If these two were to be viewed side by side, the improvements in the tiny details would be obvious. Besides what was already mentioned back in July, vectoring is better than drawing. Not only does the vector looks better, it also uses much lesser space for the raw version and can also be modified at a later date. Think of vector as the MIDI of image: they both only contain instructions on how to construct the output instead of the output itself and therefore take up much less space. With vector, I can easily zoom in to small details like the eyes or hair. With pencil, it quite difficult to do so without a magnifying glass or drawing the overall thing larger, the latter option would be impratical if a lot has already been drawn. Speaking of which, if a mistake were to be done in vector, I can easily correct it without affecting other areas, like what was mentioned in the second half of the previous post. If for pencil, not only will a mark of it (and surrounding areas) be left behind, it would be hard to correct it perfectly without redrawing it. It can also hide my horrible handwriting and easily correct outdated info written there. Not sure if I should remove the thumbnail of the pencil version of what I had already vectored as it seems redundant and the vectored one looks better. One of the few drawings that I had actually paid close attention to in the details. Plaid skirt is quite a nightmare for me to draw. 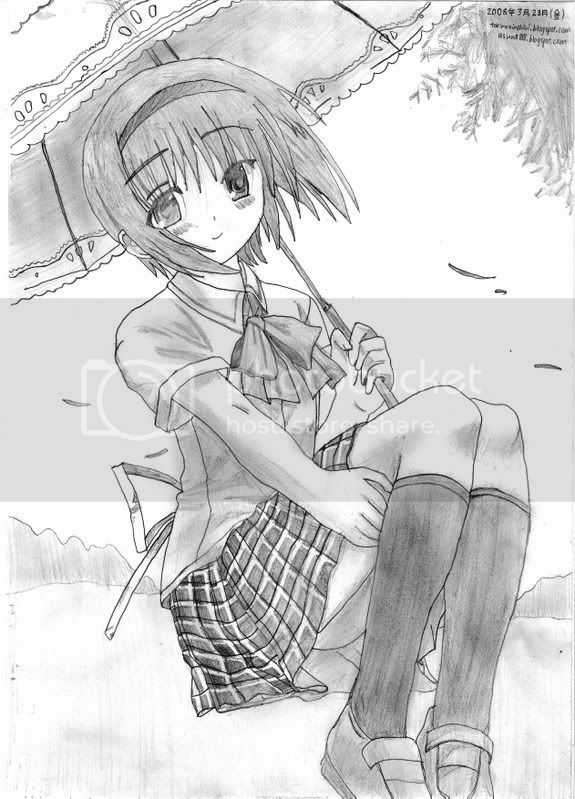 This is Mio Nishizono (西園美魚) from the visual novel "Little Busters!" (リトルバスターズ!) released just last year. It's not an anime, but other visual novels that were made by Key like "Kanon" (2002 & 2006/7), "Air" (2005) and "Clannad" (2007 & 2008/9), all of which were relased a long time ago, as you can tell from the screenshots of the visual novel. As for the characters I do, I would try to avoid main/supporting characters of anime as there are probably a lot of them already done online (if you know where to look), even more for popular anime like Suzumiya Haruhi no Yuuutsu and BLEACH. I would pay close attention to minor characters that may appear only once in the entire series. That's why you may see unknown characters but them wearing the same uniform as the main characters. 1: Clannad. Main character (Tomoya Okazaki) is walking in the opposite direction to the left of the character in the middle-ground. One of the uniforms came from the girls in the background of the scene where another (Kouko Ibuki) is the main focus. 2: Zegapain. Main character (Ryoko Kaminagi) is sitting down to the right of these characters. 3: To Love-Ru. 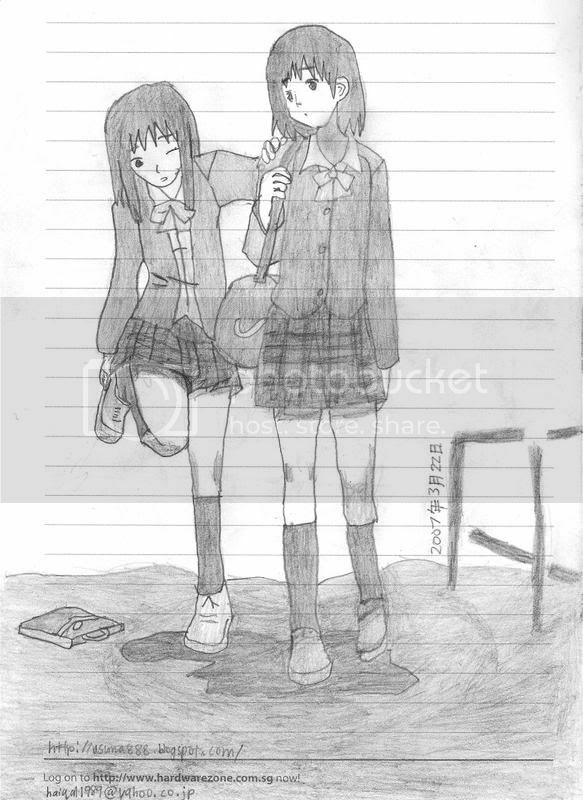 The character walked past the main character (Rito Yuki). Head and legs are not visible. 4: To Love-Ru special. From the Magical Girl Kyoko: Flame on episode 20. 5: Clannad: Another World. 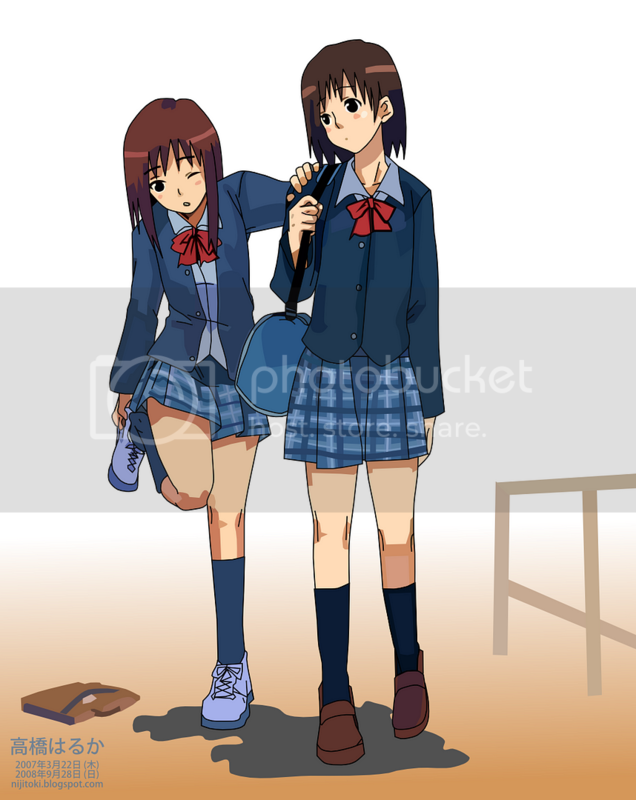 The character appeared in the background in the scene where the main character (Tomoyo Sakagami) was applauding when a signage was put up by the school's student council. They did say that it is 70% faster to load, though I find keynote no.2 funny that says about storing something massive on it.